Hello. How are you? It’s been months. Three months and some change. So what’s changed? As I was flipping through my notebook, trying to remember what I’ve been up to, I came to the entry for a random Wednesday in June, under which I’d noted: “Totally didn’t write a single thing.” Which, you know, is a nice way of phrasing what the last few months have been like. Because on the one hand, like, totally, dude. I’m kinda proud of myself for finding some flippant joy in letting myself off the hook. It was a nice summer. I totally read some books and killed some flowers and made a mess of an ice cream cone or two. On the other hand, behind those six words are little pools of fear. Because it’s true. My summer can also be measured in a string of false starts. I didn’t write much, and what I did write was mostly the same five pages over and over again. Which isn’t to say it hasn’t been enjoyable. I love the story I’m working on. But I’m terrified I won’t be able to build up enough creative mass to achieve escape velocity. I visited Italy with my family in August. It was wonderful. I’ve never been to Europe before, and one of my favorite memories is of jolting awake after four hours of sleep on the airplane, slamming the window visor open and seeing a whole other continent for the very first time. We flew right over the Swiss Alps, which was a nice way of saying hello. This was the beginning of what came to be my favorite part of Italy: getting up to high places and looking down. The Piazzale Michelangelo overlooking miles of terra-cotta roofs in Florence. The top of the one billion stairs in Positano, sweeping down through buildings that tumble to the sea. You might remember from way back in April when I wrote about my love of flying scenes. That feeling of scope and weightlessness in flight is directly connected to what I found so exhilerating about climbing to scenic overlooks. It was bliss to get the lay of the land, achieve distance, and stand near chaos without being part of it. Because there was chaos, too. Like one terrifying night in Rome, halfway through the week, when we realized we couldn’t take our luggage with us on the next leg of the trip. We were stuck in a foreign city with three heavy bags, nowhere to store them, and our options were running out. It was eleven o’clock. Our bus left at seven in the morning. I was homesick, exhausted, and hanging by one frayed nerve. I have a vivid memory of chasing my dad down the hotel hallway in my pajamas as he set out by himself to get rid of our bags one last time. I caught him just as the elevator doors closed and asked if he was okay. “It’s a mess,” he replied, then vanished from sight. Requisite in the enjoyment of high places is a connection to, and perspective on, the chaos down below. This luggage snag was not the most important part of the trip, or the most impactful, and the eventual storage solution is utterly uninteresting—but in that moment it felt like everything. Two days later, we reached Capri, and crested the peak of all high places. 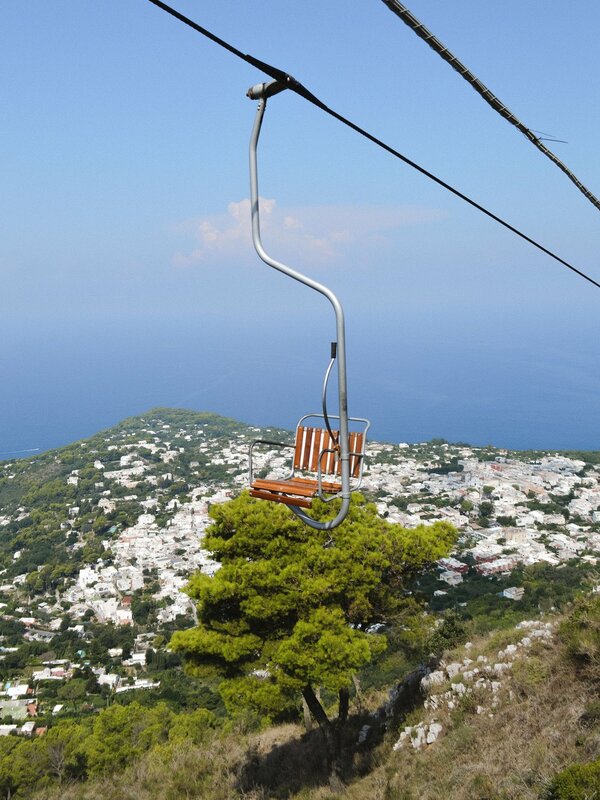 A chair lift runs to the very top of the island, to Mount Solaro, one person per chair, and it felt like flying. At the top was a 360 degree view of white buildings, white sailboats, and the Tyrrhenian Sea. The world was quiet, the breeze calm, and at last I understand what people mean when they describe water melting into the sky. I didn't think once about my luggage. My method has entailed, more often than not, the subtraction of weight. I have tried to remove weight from human figures, from celestial bodies, from cities. Above all, I have tried to remove weight from the structure of the story and from language. It is the most difficult thing for me to achieve, and yet thing I want the most. Getting to high places, both in Italy and at home, is a physical echo of a psychic goal. A desire to remove the weight from the world and just enjoy it. I’ll probably have a couple more false starts on this novel before I break out of its gravitational pull. But I trust it will happen. I’ve totally done it before.